By now you might have heard about some of the great signature events we have coming to Winter Carnival, but perhaps watching recently crowned 2016 US Men's National Figure Skating Champ, Adam Rippon, grace The Rink isn't your style. We get it, it's cold (but really, you should check it out.) Luckily we've got a host of great events and activities specifically designed to warm you up. 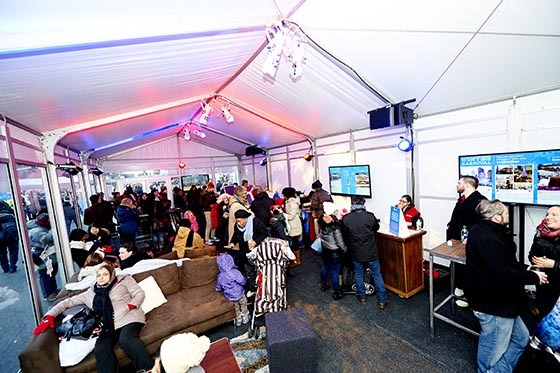 Introducing the definitive list of cozy and heated events at Winter Carnival at Bank of America Winter Village. One step inside our custom Brew House and you'll swear you've been transported to some far flung European village. Located on the skate deck, The Brew House is pumped full of long German beer hall style seating accompanied by heat lamps to ensure a cozy environment. This year we've brought in some of our favorite comfort foods from local chefs. Be on the look out for treats from Arancini Bros., Good Stock Soup, Oxido, and Bryant Park mainstay, Wafels & Dinges. We'll also have local craft brews and spiced hot drinks available for purchase for the 21+ crowd and warm beverages like hot chocolate. 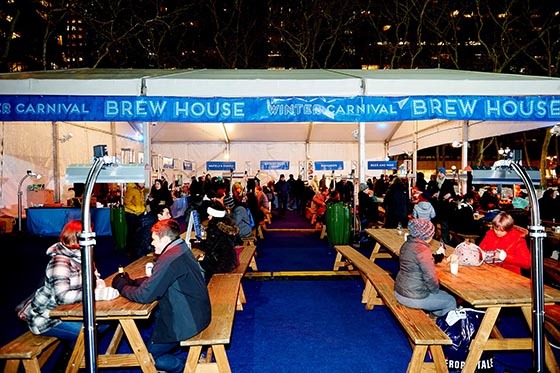 The Brew House was a crowd favorite at last year's Winter Carnival. Photo by Phillip Angert. In addition to food and drinks, we'll also have some of our classic tabletop games available to play as well as the following great activities. New this year, join us for winter and NYC themed trivia, hosted by TriviaNYC. Gather together a team of 4 or fewer players and get ready to show off your smarts to win Bryant Park prizes. Prizes will be awarded to 1st, 2nd, and 3rd place teams. WFUV Radio personality, Corny O'Connell, will provide the soundtrack for part of the evening with a live DJ set. Saturday, February 6th, from 6-8pm. Relax with jams from atmospheric crooners, Wilsen, on Saturday, February 6th, from 8:15-9:15pm. 2016 sees the return of Bank of America Warming Lodge, our favorite locale to warm up after participating in some Frozen Fingers Ping Pong and Giant Games. Furnished with plush couches, The Lodge is toasty inside and is open to all as a space to thaw out and recharge between events. Bank of America cardholders can show their card for a complimentary hot cocoa. Stop by the Upper Terrace and see what the big deal is. Stop by and vedge like some of our 2015 attendees. Photo by Phillip Angert. This year Bank of America is bringing in 3D chalk illusion artist, Joe Hill, to create a masterpiece within the park right outside the Warming Lodge. He will be preparing a 2D drawing of a wintry scene that, when viewed from the right angle, springs to life. 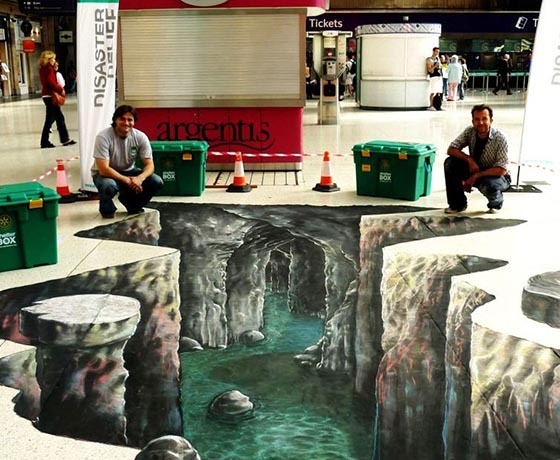 An example of one of Joe's previous works. We're excited to see what he comes up with! Photo via his website. After you get your photo taken at the Icy Illusion Photo Op, return to the Warming Lodge for a complementary magnetic souvenir frame along with your printed photo. We hope to see you there!